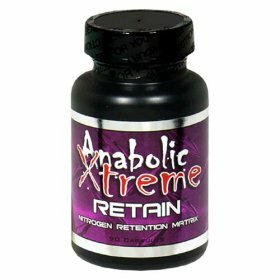 Anabolic Xtreme Retain V2 90c Retail Price: $59.99 YOUR PRICE: $33.99 Or SORRY THIS PRODUCT IS DISCONTINUED!! Return To The Ultimate Cycle Page and SAVE! Cortisol is a corticosteroid hormone produced by the adrenal cortex that is involved in the response to stress; it increases blood pressure, blood sugar levels, may cause infertility in women, and suppresses the immune system. When first introduced as a treatment for rheumatoid arthritis, it was referred to as Compound EThis is the body's horrible solution for creating energy during times of stress. The end result of these actions are an increase in appetite, weight gain and muscle catabolism (your body eating it's own muscle for energy). 17b-triol (B-Androstenetriol) is a metabolite of DHEA and has been used for years to boost the immune system and for its cortisol lower effects. B-androstenetriol is between 100 and 100,000 times more active than its DHEA precursor metabolites leaving this compound as the champion of cortisol control. 17b-triol works against inactive cortisone and muscle eating cortisol glucocorticoids. In a nutshell 17b-triol lowers the negative cortisol levels in your body. This is a good thing. Relora Study A natural proprietary blend of a patented (U.S. Patent No. US 6,582,735) extract of Magnolia officinalis and a patent-pending extract from Phellodendron amurense. Relora is a natural stress and cortisol management ingredient that helps control stress-related eating and has the added value of being non-sedating. During open human and clinical trials no significant side effects were reported. The trials measure cortisol and DHEA levels in 12 patients with mild to moderate mental and physical stress. Elevated cortisol levels and depressed DHEA levels are associated with chronic stress. A two-week regimen of Relora? caused a significant increase in DHEA (227%) and a significant decrease in morning cortisol levels . 7-Keto DHEA Study improves lean body mass by reducing cortisol and increasing testosterone ratios enabling the body to build muscle in a growth promoting environment. It has also been shown to increase your body's ability to burn calories. It is a non-hormonal, non-androgenic derivative of DHEA. 7-Keto DHEA has been shown to safely "rev up" the basal metabolic rate and thus "burn" calories more rapidly and continually throughout the day, even while resting, as well as inhibit the storage of fat within the body by controlling negative cortisol levels.